Gourmet desserts from trending bakeries delivered to your doorstep! This may just be as close to heaven as we can get this side of it! Who wouldn't love having these delicious treats arrive each month with a fantastic price of only $15 a month. Orange Glad comes with 5 bakery or coffection treats. It was so hard to share! The first and my favorite was Chocolate Sprinkled Crispycakes. This was a super marshmallow treat! So yummy. Pineapple coconut biscotti was a great treat to go along with a cup of tea. A hard cookie with a tropical flavor. Popcornopolis had a gourmet popcorn that the kids just delved into! A great treat reminded us of the fair. Chocolate Cake Bites were very chocolatey with cocoa actually sprinkled on the outside of the cake. Lemon Frosted Cookies were a hit with everyone in the family. I think this one was the family as a whole's favorite treat in the Orange Glad box. Each box comes with a insert depicting the bakery items, telling you the ingredients and sharing with you the website so you can check out more of your favorite goodies. I was very pleased with the variety in this box. I thought the price was very reasonable for the gourmet style goodies you received. 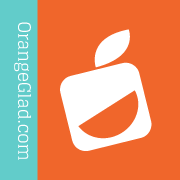 You can sign up at Orange Glad and unsubscribe at any time. Check out their October Box coming soon!